4-Inch Handmade Clay Lotus Succulent Plant Pots, Unglazed Earthenware Planters, Pack of 2 by Corasays at Tulips Orchids. Hurry! Limited time offer. Offer valid only while supplies last. 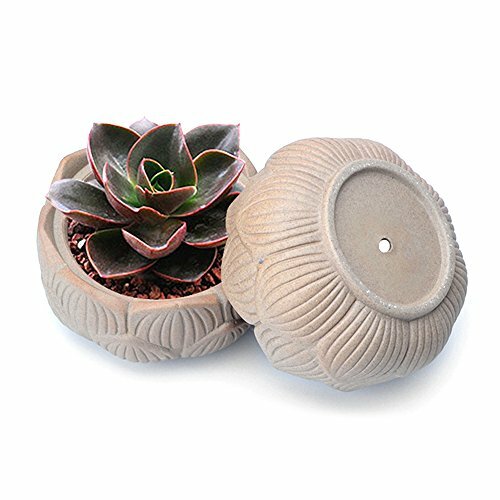 4-Inch Handmade Clay Lotus Succulent Plant Pots, Unglazed Earthenware Planters, Pack of 2 Specification: - Material: ceramic; - Weight: approx. - Ideal for indoor or outdoor container gardening. - This plant pot offers excellent all-weather durability. - This style planter is a tough, lightweight alternative to ceramic planters. - The interior of the pot has a hole at the bottom, which allows for the proper draining of live potted plants. - Ideal size for fern, moss, succulent, cacti or other plants with easy maintenance. - It's a thick, glossy ceramic, good for window sills and small apartments. Package Included: 2 pieces lotus shape unglazed earthenware planters, please notice plants are not included. If you have any questions about this product by Corasays, contact us by completing and submitting the form below. If you are looking for a specif part number, please include it with your message. Richland Wood Planter Box White Washed 20" x 4"